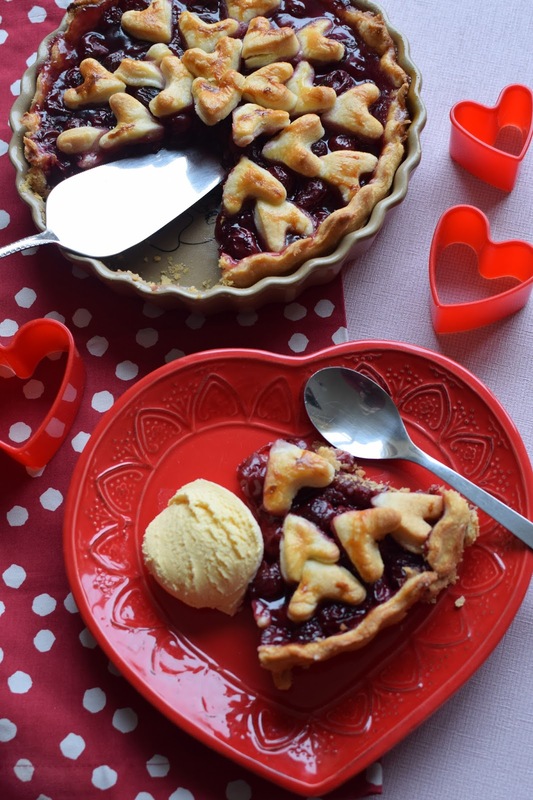 Valentine's Day is just a few short days away so I thought I would share with you my final Valentine's recipe of the year! Don't get to check out my Peppermint Candy Valentine's Biscuits and Valentine's Bark recipes! Has anyone ever said Valentine's as much as this?! Anyway, as you can see, I decided to go for a cherry pie! I saw the heart pastry design over on Pinterest, mine looks a little more rustic...but I still think it's a super cute way to make a dessert a little romantic! 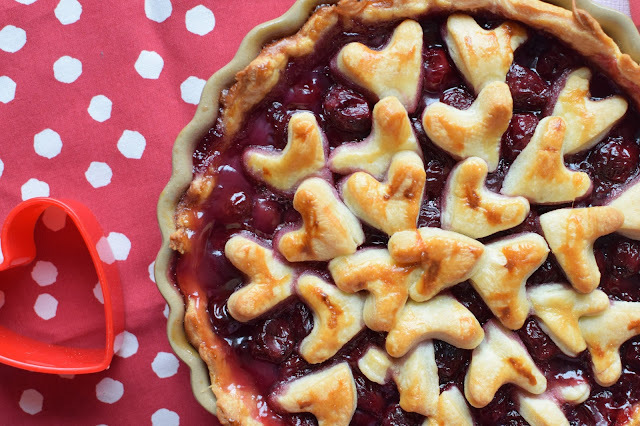 Cherry pie isn't really a big thing here like it is in America, we need expand our pie horizons! I can think why as this is so yummy! Sweet and sour and delicious served warm with a big scoop of ice cream! 1. Preheat the oven to 200 degrees C/400 F/Gas Mark 6. Grease a 20-23cm pie dish and set aside. 2. Take 3/4 of your pastry and roll out into a circle, large enough to line the pie dish with some excess. Place the rolled out circle into the dish, pressing the pastry carefully down and set aside. 3. Take the remaining quarter of pastry and roll out to about 3mm thickness. Take a small heart shaped cutter and cut out the hearts, you want about 25. Once cut, set aside. 4. 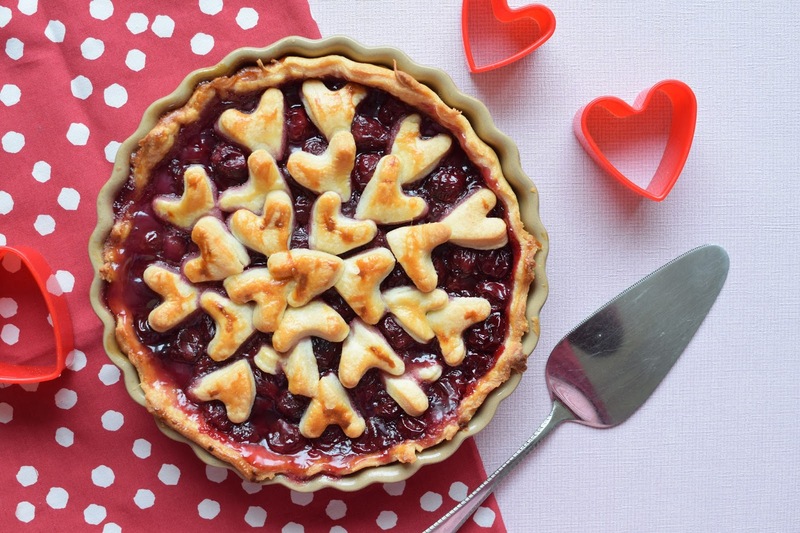 To make the filling, in a large bowl, combine the cherries, sugar, cornflour and salt, carefully toss to coat evenly. 5. Fill the pastry dish with the mixture and spread evenly. Arrange the hearts in a spiral pattern around the top of the mixture. In a separate bowl combine the egg and milk and whisk, using a pastry brush coat the top and rim of the pie. 6. Place the pie in the oven for about 1 hour, until pastry is brown and fruit is bubbling, if the top becomes too brown, place a sheet of foil over the top. Leave to cool a little on a wire rack, slice and enjoy! OH WOW!!! That looks delish!! So pretty with all of the hearts too!